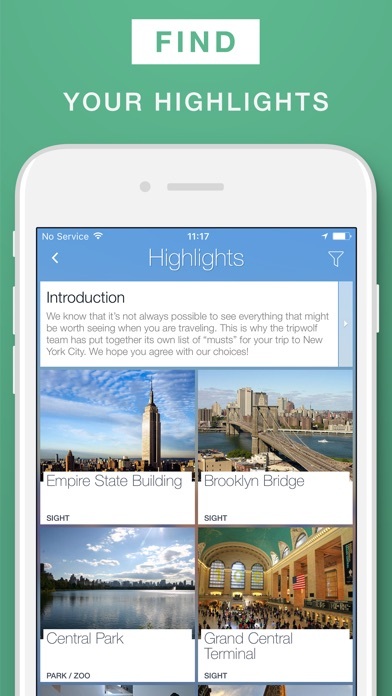 With over 10 million downloads worldwide, tripwolf is one of the most popular travel guide apps in the App Store. We offer over 600 travel guides with premium content from Fodor’s Travel - including offline maps and a trip planner. And we are continually expanding our coverage. AT A GLANCE: WHY SHOULD YOU TRAVEL WITH TRIPWOLF? » Free preview of over 600 travel guides in German, English, French, Spanish and Italian » Premium tips and photos from Fodor’s Travel and MARCO POLO as well as additional information from Yelp, Wikipedia & Foursquare » Offline maps with the most important attractions, restaurants, hotels, shops, bars, museums and public transport options » Trip Planner for optimal trip preparation – including day planning and routes on the map » Navigate on the map and see the best route on foot, by bike or by car! Let us show you the way to the nearest attraction on your list on the map. 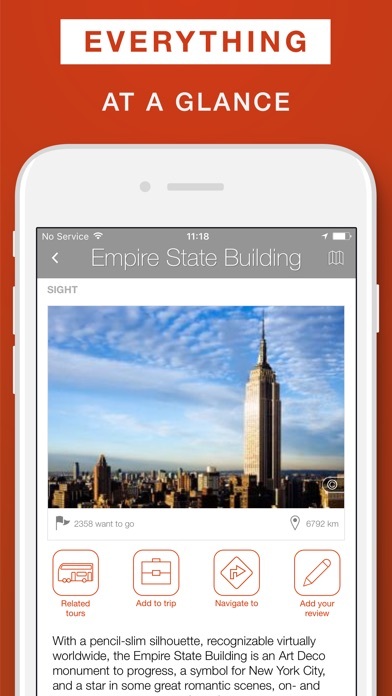 » Sync your travel guides and maps on up to three devices! 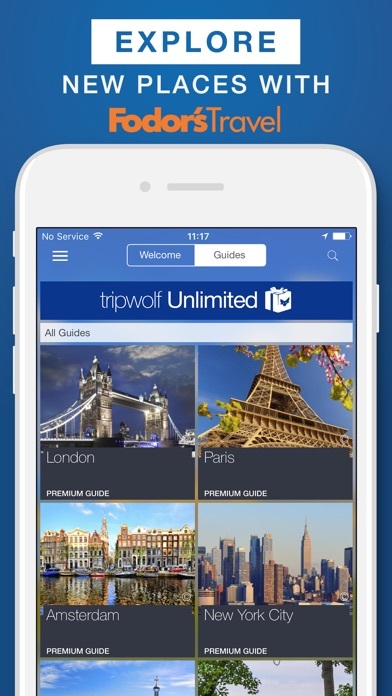 » Book your tickets, tours, hotels and flights directly from the tripwolf travel app ——— IN DETAIL OFFLINE MAPS All 600+ travel guides are available for offline use after they are downloaded. This includes the offline maps, all texts, trips and photos. To book hotels, flights or tours for attractions, you need to have an active internet connection. PREMIUM TRAVEL GUIDE A free preview is available for all travel guides. After upgrading, you have access to the premium content with the most important attractions, hotels, restaurants, bars, museums and public transport options as well as the offline maps as well as a range of other features. FODOR’S TRAVEL GUIDE CONTENT Our travel guides contain insider tips from Fodor’s Travel and MARCO POLO. Detailed descriptions, opening hours, entrance fees and other information for all attractions, restaurants, museums etc. await you! Additionally, you’ll get a perfect overview on our maps. 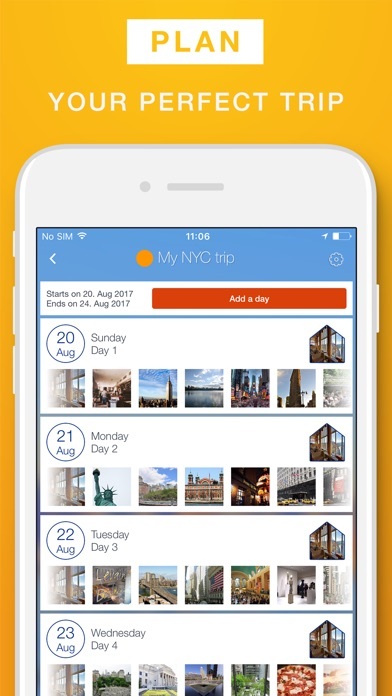 PREPARE YOUR VACATION WITH THE TRIP PLANNER Thanks to Trip Planner, you can put together all the details of your trip before, or even during, your journey. Add the most important points of interest, restaurants, shops, hotels and museums to your travel guide and you’ll get the complete route as an offline map. In addition, you can also optimise your route, letting the app automatically arrange your route by distance from your departure point (i.e. hotel). ‘NEAR ME NOW’ FILTER ON THE MAPS Filter attractions, hotels, restaurants etc. 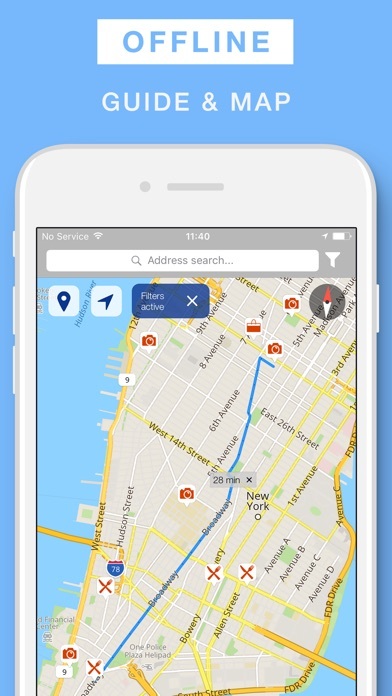 which are near you directly on the map and save time during your next city trip. Even offline! FIND THE BEST DEALS Should you want to book your trip from the app, that’s not a problem. Find the cheapest city tours as well as budget hotels, tour tickets for the most exciting attractions and flight tickets directly in the tripwolf app. Discover the best tours in cities such as Palma, Istanbul, Brussels, Stockholm, Bangkok or Los Angeles. QUALITY OF THE MAPS & CONTENT The offline map is provided by OpenStreetMap and is continuously updated. The content and photos from all other sources (Yelp, Foursquare, Wikipedia) are checked regularly and new attractions etc. are added. OUR TOP TRAVEL GUIDES Our most popular travel guides with offline maps at the moment are city guides such as Rome, London, Barcelona, Amsterdam, Lisbon, Vienna, Paris, New York, Hamburg, Prague, Munich, Venice, Florence, Dublin and Copenhagen as well as country and region guides such as Thailand, Mallorca, Germany, Switzerland, Italy and Portugal. tripwolf is a small team of travel lovers based in Vienna. We offer mobile travel guides with offline maps and a trip planner for over 600 destinations. If you have any problems with our app or would like to send us some feedback, drop us a line at support@tripwolf.com and we’ll get back to you asap! Happy travels! What a bad app. Navigation and handling is just plain stupid and makes no sense. You need to buy the in app purchase to see anything of value. On a recent trip to SouthAfrica I found the app utterly useless. Just standard info that is readily available from many free sources. Interface is broken on iPhone X. Can’t tap buttons to search or navigate. Love that the info can be available on multiple devices offline, makes planning so much easier.